What makes a truly great leader? Is it attention to detail, a vision for the future, or maybe a strong personality? Is it having an education from Harvard or another top business school? Maybe the formula for superior leadership is in fact much simpler than trying being the man or woman with the most magnetic personality and impressive resume. In fact, it may be that the best way to spot a great leader is simply to look for someone who doesn't focus on profits. What Matters More Than the Bottom Line? It may sound like heresy to say this in the business world, but the key to being a great leader is to know your place within the organization. The Barrett Values Centre has published two concepts known as the Seven Levels of Personal Consciousness and the Seven Levels of Organizational Consciousness. The Seven Levels of Consciousness start with "survival" at Level 1 and "relationships" in Level 2. The people who work within an organization at these levels are required to focus on short-term daily results. They have an awareness of the long-term picture but have their eyes on building an organization that can be successful today. This laser-like focus on the here-and-now is a great trait, but not once you get into the executive ranks. At the other end of the spectrum, different skill sets are required to be a successful leader. CEOs at levels 6 and 7 need to keep an eye five to 10 years into the future to make their companies successful. A Level 6 leader is described as "making a difference," and Barrett defines a Level 7 leader as a "wisdom keeper and visionary ... motivated by the need to be of service to the world. Their vision is global and they have a holistic perspective on life." Who Acts Like a Level 7? Does that sound anything like a quote from one of Apple's (AAPL) executives? Steve Jobs and now new CEO Tim Cook have often used the phrase "delight our customers" to describe their driving force. Jobs helped revolutionize the personal computer, changed the way we get music, and reinvented the way we look at cell phones. In talking about these products, he never spoke about return on investment or other metrics the company wanted to meet. In other words: Delighting customers was the main goal; financial returns would follow if the first goal was met. Another leader who exemplifies a wisdom keeper and visionary is Steve Ells, founder of Chipotle (CMG). The company puts its focus on quality food and the customer experience rather than creating a cheaper product like McDonald's (MCD). Ells once said, "Today we recognize that fresh isn't enough. It's important to understand how animals are raised and how vegetables are grown if you're going to source the best ingredients and serve the best-tasting food." That's one of the reasons founders generally provide better returns to shareholders than non-founder CEOs. Founders have to start with a vision for a company and are more equipped to be Level 7 leaders than those with a fancy degree or who climbed through an organization. Why Aren't There More Level 7 Leaders? 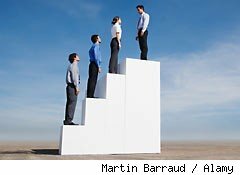 Problems arise when people are promoted through an organization simply because of success at a lower level. Remember, the skills that made you a great factory floor manager or financial manager don't necessarily correlate to the skills needed to be CEO. But that distinction is often missed, leading to a lack of quality leadership. There are plenty of examples of bad leaders, but one group that stands out is comprised of the three men who competed to succeed Jack Welch at General Electric (GE). These men were supposed to be the best and brightest from America's leadership training grounds. All three had distinguished educations, with Jeffrey Immelt and Jim McNerney holding MBAs from Harvard Business School. Despite success at less elevated levels of GE, where a lower level of organizational and personal consciousness was required, these CEOs weren't able to make the transition to a higher level of consciousness. Immelt, who succeeded Welch at GE in 2001, has generated a total return of -44% for shareholders over the past 10 years. Robert Nardelli was ousted from Home Depot (HD) after six years on the job and presided over Chrysler when it went into bankruptcy. The jury is still out on McNerney, who helped cut costs (and innovation) at 3M (MMM) and is just now launching the 787 Dreamliner at Boeing (BA), three years behind schedule. McNerney hasn't been a dud like the other two, but visionary is hardly a word I would use to describe him. When looking at companies as investments, it's important to evaluate the CEO just as thoroughly as you evaluate profits or the balance sheet. A strong Level 7 leader can have the vision to turn a company into a powerhouse, but someone without that skill can sink it. Motley Fool contributor Travis Hoium does not have a position in any company mentioned. You can follow Travis on Twitter at @FlushDrawFool. The Motley Fool owns shares of Apple and Chipotle. Motley Fool newsletter services have recommended buying shares of Apple, 3M, Chipotle, Home Depot, and McDonald's, as well as creating a bull call spread position in Apple.